Lavish. Opulent. Extravagant. When God pours out his lavish love, it cascades into our lives like a mid-summer downpour. We are deluged, soaked, immersed in divine love. In Jesus,you are precious! In your Savior, you are dearly loved! Bookmark is 3.8 x 15.2cm (1.5" x 6"); pen is 14cm (5.5") long with black ink. 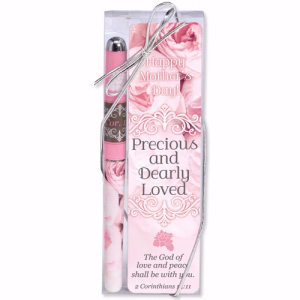 Packaged in an acrylic box with silver bow for a ready-to-give gift.